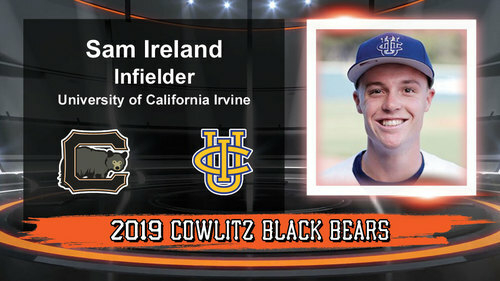 The Cowlitz Black Bears are happy to announce the signing of University of California Irvine freshman Sam Ireland. Ireland is a talented and versatile infielder for the Anteaters. His smooth fielding action and sure handiness are not to be missed at Story Field in 2019. Along with his glove, he brings a competitive bat, using the whole field with gap-to-gap power. "I’m excited to get Sam in the lineup," said Black Bears Coach Grady Tweit. "He will be a run creator as well as a run producer for us this summer." Ireland is from Mission Viejo, California, where he played at Tesoro High School. Please welcome Sam Ireland to your 2019 Cowlitz Black Bears!